4.5" Brass Toby Jug Condition is Used. 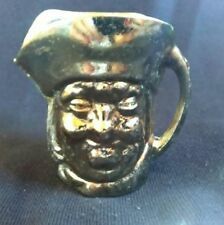 Small Brass Vintage Toby Jug . Condition is Good Approx 5.3cm Tall. Dispatched with eBay delivery – Shutl 2-3 days. Small toby jug. Im not sure what metal made from. It says made in England on the inside. It has lots of tarnish marks and stains on the inside and out. Its approximately 6.5cm tall with a width of approximately 7cm. WEIGHT 500g. HEIGHT 9cm. WIDTH 8cm. DEPTH 5.5cm. 12 cm in height and 2.5 ins. 6.5 cm in width. It weighs 0.541 kg. The Mier Space Station To Outer Mongolia - Estimate Only! 2 Smaller - 3.5 cm High x 2.5 cm Deep x 3.7 cm Wide (Spout To Handle). 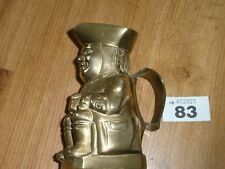 FAT BOY Brass 'Toby' JUG Dickens character in nice condition quiet heavy. In nice condition quiet heavy. 10 cm in height and 3.5 ins. 9 cm in width to the end of the handle. It weighs 0.508 kg. Would make a nice present for anyone who has a collection. Lovely miniature brass plated Toby Jug. 3.5cm tall. As Photos, approx 2.25" tall. Quite heavy/solid. Quick despatch. ANTIQUE BRASS MINIATURE TOBY JUG!